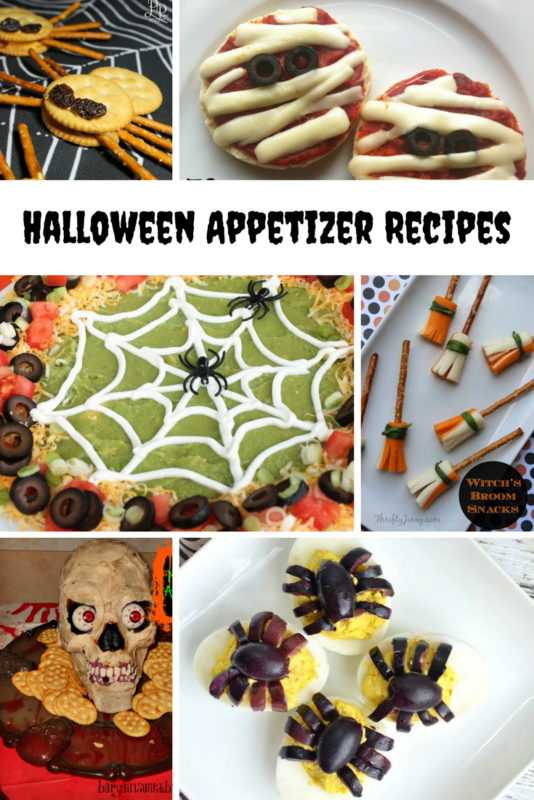 If you are preparing for a Halloween party, here are some wickedly tasty Halloween appetizer recipe ideas! 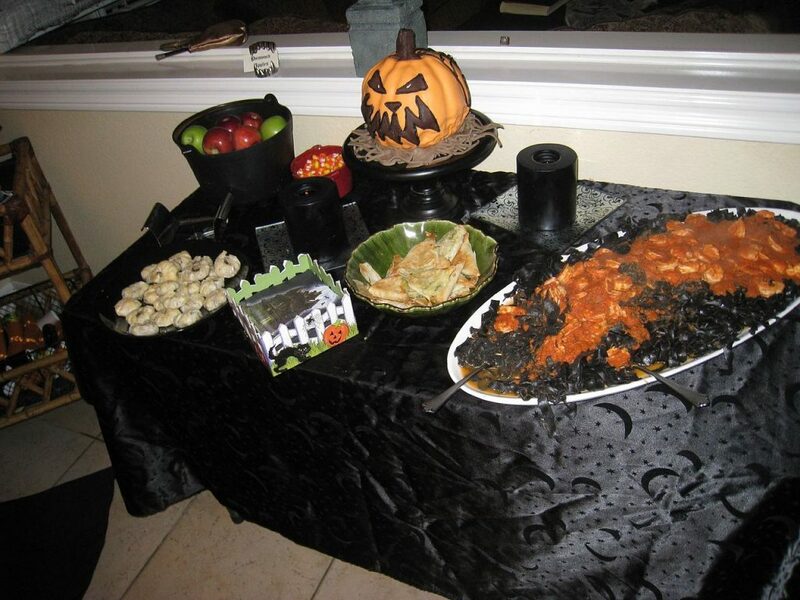 For a similar recipe, check out this Spooky Halloween 7 Layer Dip Recipe from Six Sisters’ Stuff. One year, my friend held a Halloween costume party, and for her Halloween costume, she was Black Widow spider, the poisonous spider with a telltale red hourglass on its belly. This friend coordinated a lot of her Halloween costume party cuisine to go with her spider costume. For an appetizer, she served Spiders Nest Dip, which sounds a bit gruesome but is a definite crowd-pleaser. It also went perfectly with her spider Halloween costume! For this recipe, mix 16 ounces cream cheese with a packet of taco seasonings and a cup of sour cream. Next, spread a layer of refried beans on the bottom of a oven-safe dish and sprinkle a handful of cheddar or jack cheese over the top. Place dish in oven at 300 degrees until the cheese has melted. Use either homemade or store-bought salsa and guacamole for this next step: layer salsa, then some of your cream cheese mixture, and last, some guacamole. Continue to layer your items until you run out of ingredients: beans, shredded cheese, salsa, cream cheese mixture, and guacamole. Last, when you have used up all of your layering ingredients, place a spoonful of sour cream in the middle of the spider’s nest. Place about a cup of sour cream in a plastic ziplock or grocer bag, whatever you have on hand. Cut a hole in one corner and, carefully squeezing the bag, draw concentric circles around the spoonful of sour cream. Put as many circles as you can without them blending together. Finally, use a pointed object like a toothpick to drag lines from the nest to the outside of the web. It will create a lovely web design. Serve with your favorite chips and garnish with plastic spiders. Deviled eggs haunt many a picnic, brunch, and family gathering. But little do we realize how great these are for a Halloween costume party! 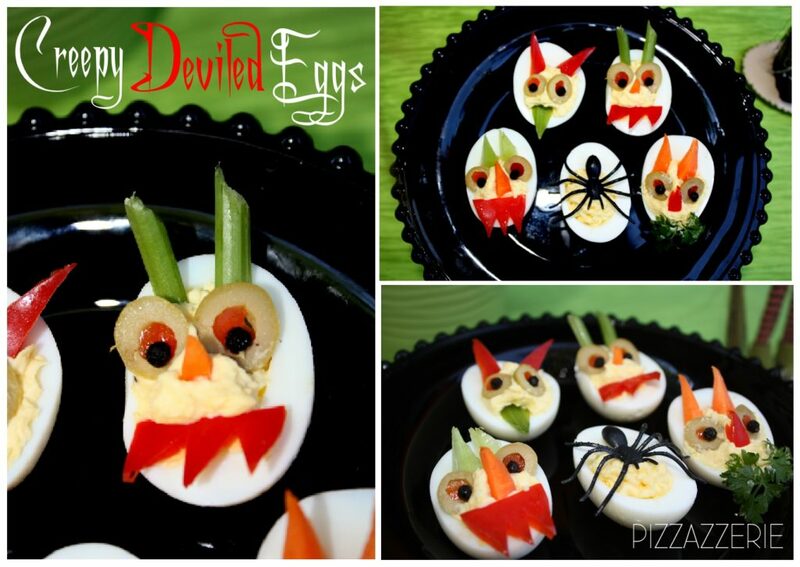 Check out these Creepy Deviled Eggs from Pizzazzerie! Boil one dozen eggs until hardboiled, cool, peel, slice in half, and remove the cooked yolks. Using a hand blender or chopper, blend together the yolks with 4 tablespoons mayonnaise, 2 teaspoons Dijon mustard, 1 teaspoon white wine vinegar, two cloves minced garlic, a dash of hot pepper sauce, and, if you like spicy, throw in a few slices of jalapeno pepper. Blend until completely mixed together and creamy. Using a spoon, stir in a few drops of red food coloring and stir until the mixture has become your desired shade. Fill the empty egg white halves with the red yolk mixture, garnish with parsley or peppers, and enjoy! 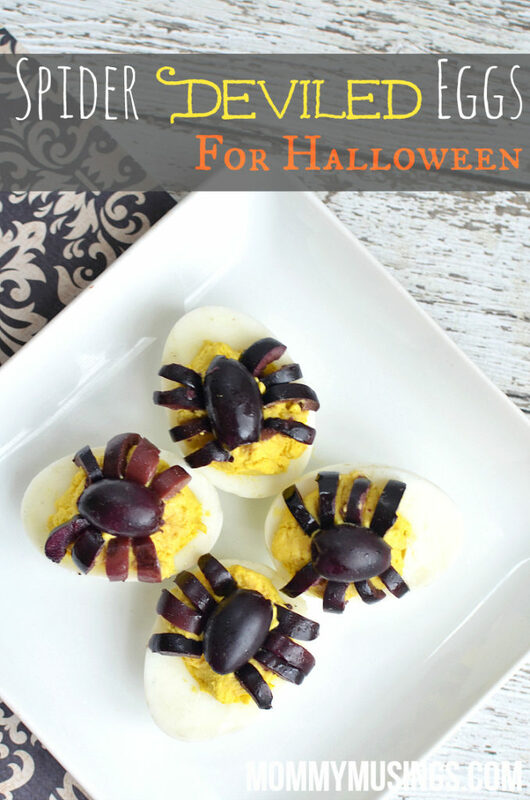 You can also decorate your deviled eggs with black olives to look like spiders like Mommy Musings did! Get the recipe for this Skull Meathead Appetizer Recipe from Simplistically Living. This would be great for a Zombie Apocalypse Halloween party! Find the recipe for these cute spiders made with Ritz crackers, pretzel sticks, raisins and peanut butter at Penny Pinchin Mom! 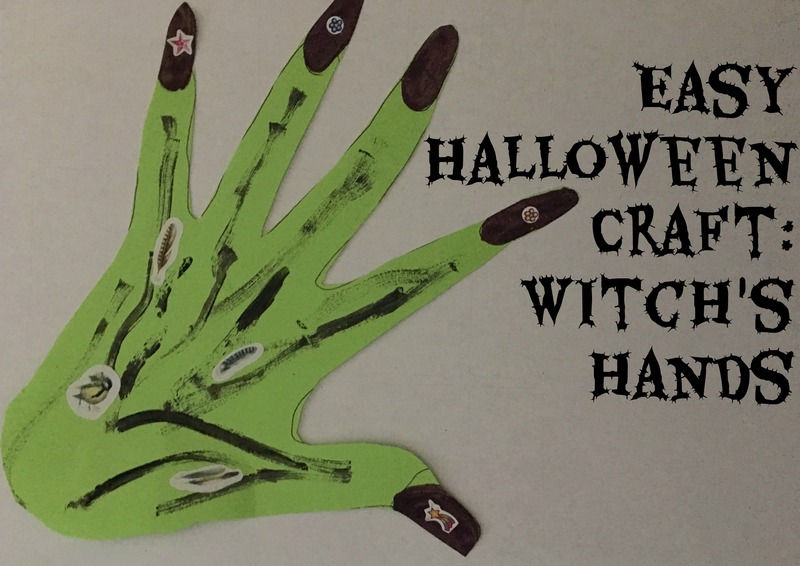 Make these cute Witch’s Broom Snacks from Thrifty Jinxy with string cheese sticks, pretzel sticks and fresh chives. Thrify Jinxy also has a recipe for Mummy Pizzas made with English muffins, pizza sauce, sliced black olives and mozzerella string cheese.